This Aztec-themed slot from established developer Gamesys is a safe bet. The Aztec theme has some legs, and judging by first impressions, this slot should continue that trend. 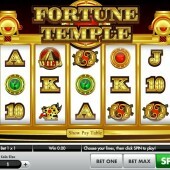 Fortune Temple is a 5-reel, 25-payline slot. The Aztec theme provides us with an array of Aztec symbols on the reels including the Aztec mask, the lizard, the bird, the priest, the dog, the vase and the regular 10-to-Ace symbols. The Wild symbol in Fortune Temple is represented by the Aztec Temple icon. This Wild acts as a substitute for all other symbols, except for the three Scatters, across the reels to help you complete winning combinations. As mentioned above, there are three Scatter symbols on the reels. The first is the red eye of premonition. That certainly does sound sinister. Ironically, if you hit three or more of these symbols across the reels then you will trigger the Gift from the Gods Bonus. In this bonus feature, the red eye of premonition will appear before you to reveal a random multiplier value. 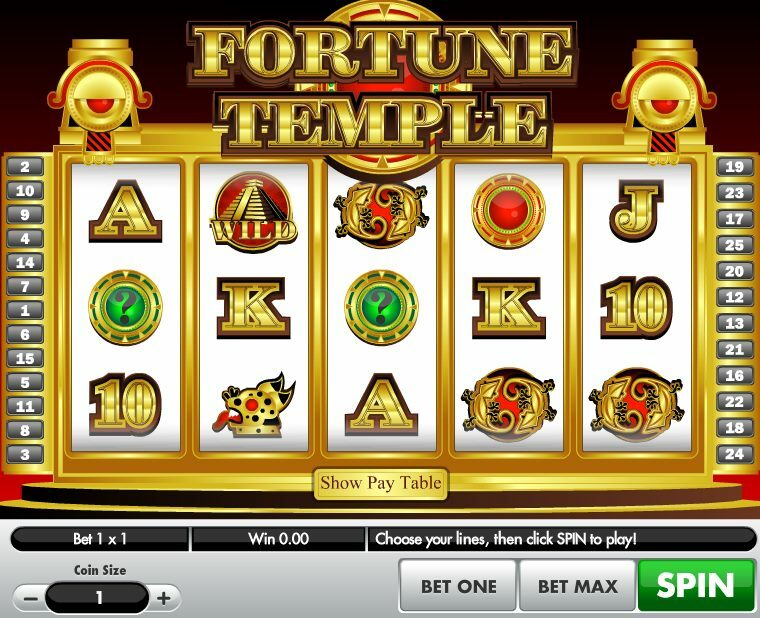 The green eye of mystery is also the trigger for a bonus feature in the form of the Fortune or Misfortune Bonus if you hit three or more of the symbols across the reels on a spin. In this bonus, you will be presented with six doors. You must open the doors one by one in six different stages. Behind each door, you can reveal either a gold coin (win coins), skull (ends the bonus feature immediately), or an open all doors icon (opens all six doors and adds the coins behind these doors to your prize total). If no skull appears behind a door then you will continue until all six stages of the bonus are complete and you win the total amount of coins collected behind all of the doors. The third Scatter comes in the form of the red eye Scatter. This is a basic Scatter whereby if you hit two or more of these symbols across the reels then it will reward you with a pay out. Fortune Temple is reasonably simplistic but it is a thin line between simple and boring. Gamesys just about get away with it on this slot. I do love a good Aztec-themed slot. You need look no further than Betsoft Gaming’s 3D release of Aztec Treasures or the very underrated slot release of Play’n Go’s Aztec Idols slot to see why they are so enjoyable. There are better Aztec-themed slots out there but for a slot in general then you won’t be too disappointed with this slot.